We've put this kit together to make it as easy as possible for our customers to install 3 feet of premium quality UltraBright™ Design Series LED strips. This kit has everything you'll need to successfully complete your strip light project right out of the box. Our UltraBright™ series lights are most popular with designers, architects, as well as those who want superior lighting for their specialty projects. With our solderless connectors, you can easily attach the flexible LED strips to just about anywhere. LED strip lights are very low profile and can be used in hundreds of applications. This kit produces a significant amount of light and is appropriate for small task or specialty lighting installations. Product UltraBright™ Design Series LED strip light kit - 3 ft.
Are there more options for buying UltraBright™ Design Series strip lights? 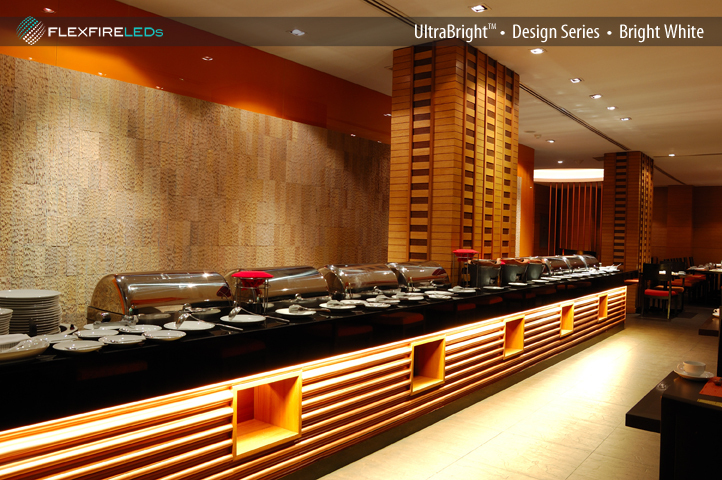 Yes, we offer UltraBright™ Design Series LED strip lights for purchase as an individual product as well. Yes, there are several options for dimming this strip light kit. The easiest method, which can use the same power supply listed with this kit, is to use one of our non-Lutron dimmers, such as the dial dimmer, in-line dimmer, or touch dimmer. If you want to install the lights with a Lutron Wall Dimmer, check out our 3ft. UltraBright™ Design Series strip light kit with Wall Dimmer where we've already selected the compatible components and power supply. Need assistance with your project or purchase? Our design specialists are ready to help.